Though long reach, the secret is the small hole through which you can reach that far! Long reach pliers have always been handy but traditionally they had the distinct liability of needing a large opening through which to operate. The problem was the long handles that had to open widely to grasp even relatively small objects in their jaws. The GearWrench™ Double-X™ Pliers Set dramatically reduces the size of the opening needed to open their jaws fully which increases their versatility and usefulness in the real world a bunch. Add quality manufacturing and materials and the GearWrench™ Double-X™ Pliers Set is firmly in the must-have category. The GearWrench™ Double-X™ Pliers Set consists of a straight jaw and bent (45-degree) jaw pliers with the jaws on both formed in the familiar needle nose shape. The pliers are 13-1/2”-long overall with 9” of that ahead of the grip area so they really do have an extended reach into many obstructed areas. The jaws have serrated inner surfaces to help increase grip even with minimal pressure applied to the handles. The handles themselves are covered with a slip-resistant rubber-like coating that is comfortable to the hand and makes handling the GearWrench™ Double-X™ Pliers Set easier overall. The GearWrench™ Double-X™ Pliers Set use a double joint hinge system that dramatically increases the amount of jaw opening compared to how widely the handles are spread. All of the pivot points use tough steel pins that are ground flush with the surface. At full throw the handles (at the forward edge of the grip surface) open about 1-3/8” while the jaws are open just under 2”! That means you can reach into a 9”-deep opening and still be able to grasp an object that could be too large to fit out through the hole into which you are reaching! 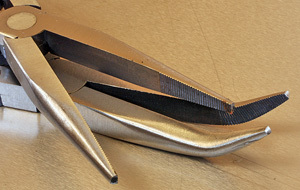 The Double-X™ system (left) compounds the movement of the handles to open the well-made jaws (right) through surprisingly small access holes. 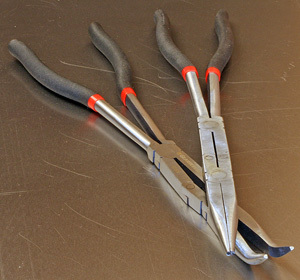 Using the GearWrench™ Double-X™ Pliers Set really is no different from with regular pliers. The Double-X™ pivot system is very smooth with surprisingly little drag considering the total lack of play in the joints. They do feel a little forward heavy which is totally understandable because of their length and that fact that they are made from solid steel with no fudging on the heft of the handles and jaws to be sure they are more than strong enough for the job. The handles grip areas are soft enough to be comfortable but have a surface that lets you develop a secure grip. The GearWrench™ Double-X™ Pliers Set system might take a little getting used to because the jaws open and close a tad faster than with regular single joint pliers. This is a small consideration that goes away entirely after using these tools for a short while. 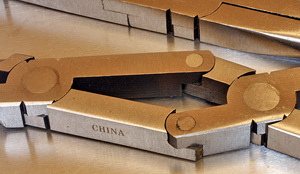 The GearWrench™ Double-X™ Pliers Set is well made and the double pivot design works at least as well as is claimed in the manufacturer’s literature. Personally, I think using these pliers on the job is actually a little easier than many because of the comfortable grips and the quick gripping power that you can generate. The GearWrench™ Double-X™ Pliers Set seems to be made from quality steel and the fit and finish is as good as any pliers I have seen. Despite all that the street price of just $39.99 (7-16-2012) for the set of two shown in this review makes them an even better value. These are tools that with common sense care on your part should last a lifetime and that makes the price even better yet.